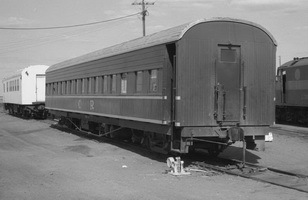 Timber bodied second class sleeping car built by the Commonwealth Railways at the Port Augusta workshops for the Ghan. Four berths were provided in each compartment and 24 sleeping passengers could be accomodated. In later years it was used as a sitting car on the "Chaser" and as such could seat 48 passengers. - Withdrawn from the Central Australia Railway as a result of bogie damage in a derailment at Anna Creek. 26.4.1980 Sold to Pichi Richi Railway.